A private (farmers) Aire and SP. Self Service Menu. Overnight $4 per unit inclus 2 persons. Includes WiFi. $2 shower, washing machine etc, etc. All in honesty box. Many speak of facilities and stop overs on the French Motorways. Well this is one. Whilst they have SP etc, the toilets were unusable (BR). Max stay 24hrs. OK I guess if you need to sleep on a long, non stop run to the south. On RN north of Bordeaux, this little place is teeming with vintners all offering foc stop overs for CCs. As we were pushed for time, was stayed on the Intermarche CP. Only later saw the pizza hut takeaway next door. Missed any sort of sightseeing of which there was plenty. A Salamanca University campus town. The Aires are on a large CP next to a gated park. Ave Jean Ponce de Leon, 21xP, SP, no taps for water, have to use a spanner type key..... The pressure is HIGH. But all foc. It was busy, even in February. As you can see from the map, there are a number of facilities nearby. Two Aire's in this old town. One not far from the centre and castle is next to a large play area. 12 marked CC bays and euro-relais Bourne. The second (no picture) is in a residential area on the other side of the river, with a great view of the town.No facilities at this one. At the upstream side of town, past the railway station there is are ca 25 MH bays, each individually locked. Key from the bar at the nearby tennis club. Each bay has it's own water tap and EHU. Grey waste runs into a common drain. An SP for elsan is at the end of the row. The town is obviously and deservedly popular. There are many friendly bars and restaurants nearby.... All up hill! The view, overlooking the river and bridges is excellent. There are plans to build a further 20 bays in front of the adjascent coach park. The centre of the Port Wine industry. The town has an older Aire with no services, right in the centre. Surprisingly each of the 4 bays offers free 16amp EHU. The river side has a bike and jogging track, the banks are dotted with fishermen. It's a good place to stop. Near the NATO airbase and in the middle of a national park, there is a beach side CP on the sand dunes. No facilities and no restrictive signs but i suspect no camping behaviour would be allowed in season. Large pick nick area in the forest. A popular CP for dog walkers and sea watchers. The Atlantic was wild! Not far away as the crow flies but through the rather affluent looking village of Avanca there are marked foc bays for CCs down by the river canoe and sailing club. Children's play area. The Service Bourne was caged and required a key. Small village off the beaten track and down by a pick nick area along side the muddy river. 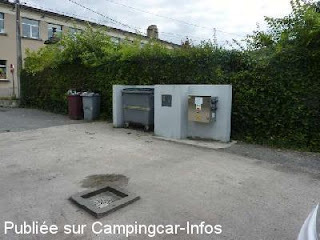 There was a Service Area for Elsan and Grey waste, also bins but no fresh water. 5 bays marked for CCs. Bays for 6 CCs marked out near Mercado and Service Bourne adjacent. All foc. Quiet night. There are two Condeixias, al Nova and al Velha. Al Velha is the small village next to the large Roman town containing many villas with excellent floor mosaics. There was a large CP, no facilities and seemed many CCs would stay overnight. Individually locked parking spaces, About 12 bays. Plus key for EHU. All for $2/48 hrs. Key can be got from the Bar by the entrance arch. Estarreja is a nice little town, interesting old roads and a large farmers market. The Aire is near a sports area and meeting hall. Also Open Air swimming pool. Free WiFi at the nearby bar. Handy mobile shop near the Arch Cafe. 6x P terraced, plus SP Aire, newly built by a pick nick area on the main road side. Near to Olivera do Hospital. (named after the Hospitallers HQ). Communal BBQs, washing up and seating areas. Bet it's full in the summer. Nice and helpful mini bar / snack bar, served us with 'wood pecker'. Very nice. We travelled on the 'old' mountain road from Vila Formosa to Guarda.... nice drive but missed the essential booths to pre-pay Motorway Toll cards, otherwise difficult to do in Portugal. There was a campsite up in the town by the Arena and an SP next to a large CP near the Sports Centre in the bottom of the valley. Our first landfall in Portugal. Through the border entrance area to the town there is an Aire and SP for motorhomers in the Zaza shop car park. Just up the hill is a supermarket and bars. There are 12 x P, cost $5 and EHU costs $2.50. Zara is an Aladdin's cave for things you need and never thought you'd want. This was an excellent find. Just off the motorway and over a magnificent middle ages bridge, this sleepy little village offers 4 x P plus a foc service point. Unfortunately the restaurant was closed but there were friendly little bars in the evening. The Aire was large, busy and quite a distance from the centre. Now at least we can say we have stayed at Biarritz! You have to pay on entrance with a credit card and limited to 48 hrs. EHU included. Opposite a school there is a dedicated area for 8 CCs. The waste disposals were quite unique. Only one tap for water and rinsing so didn't take water on board. Not a single American car in sight but plenty of others collecting kids and dropping them off. The EHU didn't work, much as we tried. Small village which offers 8 x P near a 'fitness track' for joggers, strollers or cyclists. Services $2, tokens in village shops. EHU on Bourne. Massive CP near town edge. Next to rear entrance of police station. Well lit but nothing else. Obviously free. We parked near the coach bays. A very interesting small town on the Leine river between Hildesheim and Elze. Would have been handy in the old days when visiting Globus at Einbeck. Parking near a park and new sports centre where water can be got when things arn't frozen. Photo not ours... lifted from Internet. Px4, Parking $4, we didnt pay. and $1.50 for EHU which were turned off. The dedicated Motorhome area is closed in January, however we are permitted to stay on the outside Parking Nord 9. This is where the vans and smaller goods vehicles park up too. Costs $9 per day. There are bins and toilets inside the Parkhaus. About 30 mins from Hanover. We stopped in order to charge up services before the Messe. 12 x P, foc, EHU $1. A good site and large but not the cheapest. Next to sports centre. Safe and sound at edge of village. Imagine very popular in summer time. At the end of a very long, sometimes narrow and always pot holed road. The Monument CP overlooks the channel and you can see France. Stunning views. Quite remote, no services. Coast Guard look out station at end.